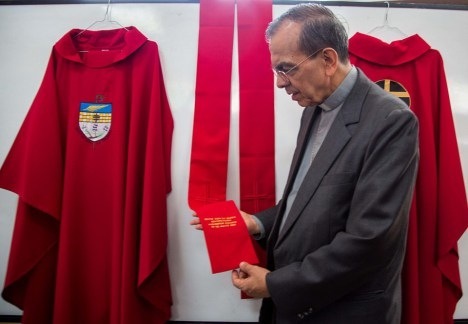 I noted with interest that the vestments worn by the bishops for the May 23 beatification ceremony for martyred Archbishop Oscar Romero were martyr’s red and emblazoned with the coat of arms of the slain archbishop. I’m not usually a big fan of heraldry on vestments but in this case I think it was a nice touch. This entry was posted in Archbishops on May 24, 2015 by guyselvester. The rosemary is canting: romero (spanish) = rosemary. For the fess I haven’t an explanation.